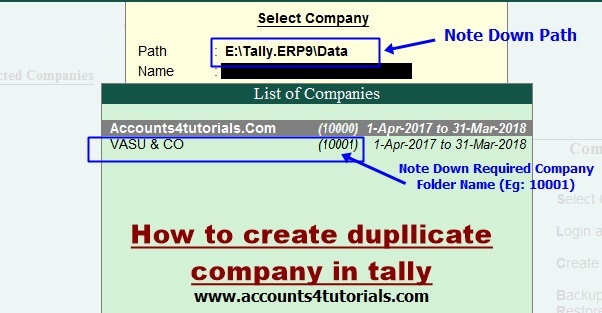 Sometimes you need to create a duplicate company to change transaction in tally to file Income tax returns or another purpose. 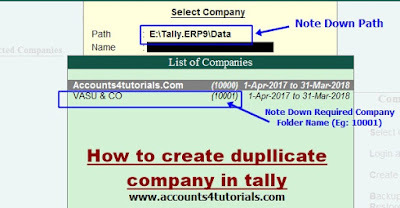 At this time you need to keep original data and create a duplicate company to finalize accounts. This tutorial helps you, best way to copy original data and how to create a duplicate company. For Example, I have company data in the name of VASU & CO. I need to create a duplicate company. 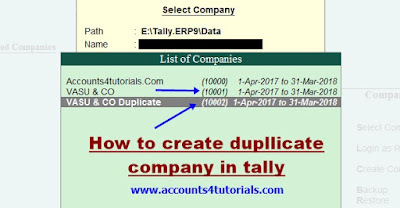 Follow the below steps and video tutorial to create the duplicate company in the tally. > Copy the 10001 folders and paste it in the same location. > Now you can view another folder with the name of "10001 -Copy". > Just change the folder name form "10001 - Copy" to "10002" or etc. > Tally displays two VASU & CO Companies with the same data. > Select VASU & CO Duplicate (10002) and change transactions as per your requirement.